Bandit has stolen the beatz from the Rhythm Nation. The Nation lies silent waiting to get its groove back. Help Nev to restore their tunes by dropping beatz on the Smile Radio stations and waking up the sleeping seagulls before time runs out. 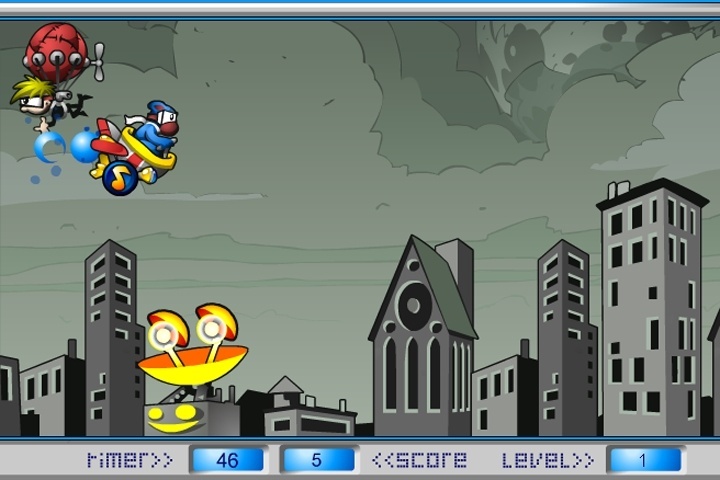 The skies are busy - steer clear of Bouncer Boy in his balloon and look out for Bandit in his no-noise machine at the end of the level. If you survive, try your luck at level 2. Destroy the radio antennas and avoid the other ships that fly over the city. Fly your aircraft and throw musical bombs. Drop your beats just right so that they power up the satellites waiting to broadcast. If you want to play Drop Da Beats games online you have come to the right place! GamesLoon adds new Drop Da Beats games every week. This is your game portal where you can find the biggest collection of free Drop Da Beats games online. Do not forget to rate our Drop Da Beats free online games while playing!